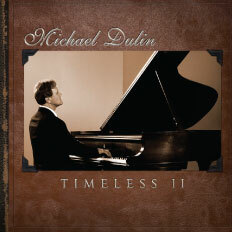 The sepia photograph of Michael Dulin sitting ramrod straight at the piano on the cover of his latest release Timeless II is anachronistic as well as prophetic. Reverting to a certain degree to his concept on his 2004 album Timeless, Michael once again proves that classical and contemporary music can be blended seamlessly together to create intriguing compositions and it can thrive in a modern age. Michael is a master at uncovering quasi-contemporary variations on well-known themes. On Timeless II, he deigns to add light strings to some of the works on this recording and the accompaniment is welcome as well as refreshing. Michael Dulin lives and works in Birmingham, Alabama where he is founder of his own label, Equity Digital. He is a graduate of the celebrated Julliard School of Music as well as a multi-award winning composer, garnering several Lifestyle Music Awards and the Carnegie Hall International Piano Competition. He currently owns PSI Studios with partner Daniel Whiteside. He writes for not only radio, television, the big screen and his loving wife, Jan, but for our entertainment. He begins this crystal-clear recording with a piece called Partita. Before there were suites, there were partitas or parts. Bach composed partitas at a tender age and they became his English, French and to some extent, his German Suites. The Partitas were some of Bach's most complicated works and they are still prized today as technically challenging teaching tools. Partita is a contemporary minuet. Dulin has used the original themes of Bach's B-Flat Partita, and using very dexterous strokes, he crystallizes the beauty and cadence of the opus into a modern pièce de résistance. Michael's arrangement of one of the world's most well-known and beloved sonatas, Beethoven's Piano Sonata No.14, commonly known as The Moonlight Sonata is superb. True to form and hauntingly beautiful, the piece shimmers with its own light as it seduces the senses. The delicate addition of background strings is responsible for its fantasy aura. You can feel the cool, starless night, the bright, selenium glow of the moon and the beating of two hearts. This was Beethoven's melody for a young devotee and in this rendition, you can hear the bittersweet angst of unrequited love. Sicilian Song has all the depth and drama of a film score, but no, it is not from the Godfather. We would have to travel Bach in time to the early 1700's to identify the piece as his Siciliano: Sonata in E-Flat Major. I believe that this piece was originally written for flute and harpsichord, but Michael literally makes it his own with his brilliant piano scoring and vaporous string accompaniment. It is just shy of a waltz tempo, but the feeling it creates is one of lightly drifting, like leaves falling at the end of autumn. It did turn out to be a favorite on Timeless II. Another old friend is Michael's performance of Romantic composer Camille Saint-Saens' The Swan. It is hard to believe that Saint-Saens forbade his suite The Carnival of Animals from which this piece is taken, to be performed during his lifetime. It did however, guaranteed his fame posthumously. This particular rendition is luxurious. Michael's interpretation of Chopin's Romanza, the longest track at over ten minutes, appropriately closes the recording. He has changed the Master's farewell 1830 concert into a light fantasy and it is all the better for it. It is a difficult piece to play as the piano takes over the main voice of the complete orchestra. For New Age aficionados it is a warm, flowing piece, slower than a waltz, but soothing in a sensual manner with portions of it maintaining a dreamy quality. For Classical devotees the piece is as true to form as contemporary methods can produce without the stodginess of the era and still preserving Chopin's idea of romantic calm. It is a beautifully performed and quite memorable. In this day and age we talk about musical "fusion"; ethnic, World, jazz. I cannot think of a better example of it than Michael Dulin's incredible fusion of the old and the new on Timeless II. It superimposes a delicate, translucent glazing of modern emotions over the history and strength of much cherished Classical pieces. It is something the old world masters would be pleased to hear.